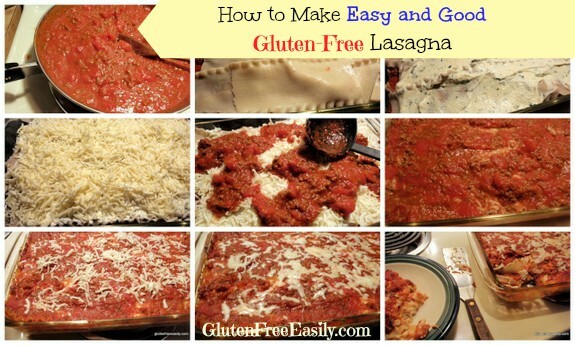 Easy and Good Gluten-Free Lasagna Recipe--What We All Want! “Easy” and “Good.” Those are probably my two favorite words when it comes to recipes that I want to make and serve my family and friends. Those words can pretty much describe all except a very few recipes in my repertoire. This Easy and Good Gluten-Free Lasagna has been a favorite of ours for a very long time. 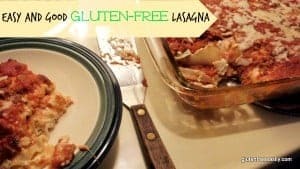 My friend Annie created the original gluten-full recipe because she wanted a lasagna recipe that tasted great, but was not too complicated. This was years ago when Annie was married the first time and before Mr. GFE and I were married, so this recipe has stood the test of time. She called hers “lasagne.” She said it the same as “lasagna.” She just spelled it differently. I have always preferred that spelling over “lasagna.” What’s the difference? Grammarist states that “North American English speakers use lasagna. English speakers from outside North America usually use lasagne.” The word—and the dish, of course—are Italian. Lasagna or lasagna refers to both the pasta noodles and the casserole dish made from them. If you’re into grammar, you’ll want to know that lasagna is the singular form and lasagne is plural, but the latter is used as a mass noun (I prefer to think of it as a “collective” noun) and takes a singular verb. 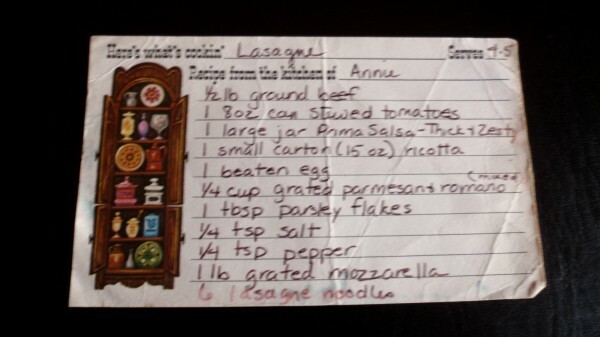 Despite having a degree in English (you don’t want me to get into “bachelor,” “Bachelor of,” or “bachelor’s”), I don’t get too hung up over at grammar as I personally still make grammatical errors on a regular basis, but I did want to explain Annie’s use of “lasagne.” That spelling just seems more elegant to me. But before we go on, let me make this point clear. If you’re Italian and/or a lasagna purist, this lasagna recipe is probably not for you. It uses ready-made sauce in a jar, ready-made non-fresh tomatoes (diced or stewed; jarred or boxed tomatoes are fine, too), and it comes together fairly quickly. There is no “Mama!” in an apron waiting to for her homemade sauce to reach its peak perfection before her prized lasagna can be made. Like any good lasagna, it always tastes better on the second day, so I often make it the day before I want to serve it. It’s good on the first day, but the flavors do that wonderful melding thing and the overall texture is much improved on the following day. So when making this recipe for guests, I always make it and bake it the day before, then just reheat it for our special meal. 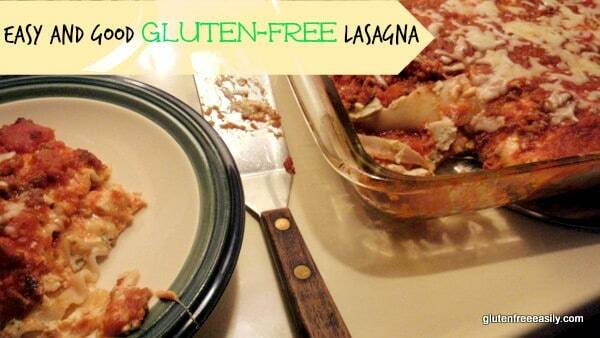 When I went gluten free, I simply started making the recipe with gluten-free lasagna noodles. Some brands of gluten-free lasagna noodles fall apart quite a bit after you cook them. But it really doesn’t matter in this recipe. You just layer the noodles and the pieces as if they were whole, overlapping them slightly and filling in any holes. Piece-meal noodles or not, we have always been just as happy with the gluten-free version of this recipe as the original gluten-full version. I’ve made a few other changes to Annie’s recipe, but nothing too drastic. I usually use more meat for Carnivore Man (aka Mr. GFE), but I personally prefer this recipe with less meat, sort of as an accent to the noodles, cheese, and sauce. And if you’re in my age bracket, you probably know that the size of jars of ready-made pasta sauce have shrunk over the years. So while Annie’s recipe called for only a cup of tomatoes, now I have to add another ½ cup or more of tomatoes or pasta sauce to the get the total sauce and tomato measurement to be sufficient. I usually opt for adding more tomatoes instead of opening another jar of sauce, because it gives my lasagna more of a homemade taste. Plus who really has a good use for less than a full jar of pasta sauce? Here’s are step-by-step photos showing how I make my lasagna with the recipe below. This recipe is not really complicated enough to have a “tutorial,” but I like photos. Enjoy! Meanwhile cook lasagna noodles. Near the end of cooking time, preheat oven to 350 degrees Fahrenheit. Place lasagna noodles in the bottom of the baking dish, slightly overlapping them. Don’t worry if your lasagna noodles break apart; just use them piece-meal to cover the bottom of the dish. In a separate medium-sized bowl, mix egg, ricotta cheese, grated Parmesan and Romano cheese (or either Parmesan or Romano), parsley flakes, salt, and pepper. Mix well. Bake at 350 degrees Fahrenheit for 30 minutes or make ahead, refrigerate without baking, and bake for 45 minutes when ready to serve. ~ Makes 4 to 6 servings.~ 1 ½ cups vegetables of choice (e.g., spinach, mushrooms, onions, zucchini), cooked and drained (if needed), may be substituted for the meat. I brown my veggies in a small amount of coconut oil, grape seed oil, or extra virgin olive oil. I prefer to cook them down long enough so there is no excess liquid to drain. But if you don’t cook them that long, you’ll want to drain the liquid so your lasagna is not watery.~ Using stewed tomatoes versus diced tomatoes makes a heartier and much more appealing lasagna dish for the “purists.” I use my kitchen shears to cut up the larger pieces of the stewed tomatoes for Mr. GFE who hates the texture of tomatoes most of the time.~ I like to use a ladle to evenly distribute my meat sauce (as shown in photos). Then I use a spatula to evenly spread it out as a layer.~ I sometimes sprinkle on a little more shredded mozzarella on top of my lasagna 10 minutes before it will be done to get a prettier presentation. You can see the lasagna before and after that touch in the photo collage. We don’t do cow’s milk, so I would change this up with goat milk mozzarella, sheep’s milk Manchego, and soft chevre for the ricotta. Makes a really rich and wonderful lasagna! Hi Audrey–First, it’s great to see you here again. 🙂 Second, I’d love your lasagna! I have a wonderful source of homemade chevre, but no source for alternative Manchego and mozzarella. Do you have a local farm where you get those or a local store that carries them? This has nothing to do with this recipe. Just wanted to let you know I made your crustless coconut pie for a couple people that watch their gluten intake. We ALL loved it. It was gone very quickly. I did use almond milk. Hey Charlotte–Yay! That’s wonderful news to hear! 🙂 That recipe is very adaptable to different kinds of milk, fat, sugar, etc. Thanks for sharing your review! Easy and good = my kind of recipe! And I am a huge fan of saving recipe cards in my favorite people’s own writing. I have some of my grandma’s recipes that I cherish. And I recently decided I want an old-school tin over sized recipe box — let the hunt begin. I’m adding this one to my box! Sarah–I’m glad we agree on “easy and good.” 😉 I have several recipe boxes. I actually had an old school tin recipe box and I think I consolidated and let that one go. It wasn’t terribly oversized though. Good luck in your quest! Oh and by the way, that’s actually my writing from when I copied my friend’s recipe down. It still takes me back though! Is there a gluten free ricotta available? Or a replacement? Hi Traci–Welcome to gfe! 🙂 Ricotta cheese is naturally gluten free. I know of no brands that contain gluten. Always check labels, of course. Hope you get to enjoy this lasagna! I like ‘easy’ and ‘good’ too, Shirley! Your Gluten-Free Lasagna looks delicious! I love the original recipe card too. Stumbled and will schedule to pin. Thank you for being a part of the Hearth and Soul Hop. What if you use No-cook lasagne instead? Do you make it the same way? Hi Gail–Welcome to gfe! 🙂 I’ve never worked with the no-cook noodles before. I’ve read a couple of recommendations on using them though. One was to let the recipe “sit” for about 5 minutes or so before baking so that the noodles start softening. I’ve also read that covering the dish except for the last 10 to 15 minutes of baking ensures that the noodles cook all the way. You might try both of these tips at once to ensure that your no-cook noodles cook all the way. Good luck, and please let us know if these tips work! HI there– is this recipe OK to make 24 hours ahead? Hi LR–Welcome to gfe! 🙂 Do you mean is it okay to bake ahead 24 hours before serving or make ahead without baking? Baking this recipe ahead works great as it always tastes better on the second day (or later). As far as making it ahead without baking, I’ve never done that. I think I’d be afraid that all the sauce would settle on the bottom over time. I could be wrong though. Please let us know how it works out if you give it a try. Fingers crossed!